Hearing that the flowers on the West Coast were wonderful this year we decided to take advantage of the perfect weather on Friday to head of to Posberg. 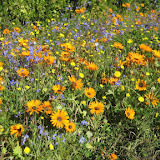 There have been good rains in the area this year, as well as further up in the Clanwilliam and Namaqualand, but this is the closest toCape Townone can go to get the real wild flower experience. Posberg is a private nature reserve within the boundaries of theWest CoastNational Parkand managed by SANParks. It is only open to visitors in the flower season of August and September each year. It has an extensive network of roads for drivers, but you only get the true benefit of the beauty of the flower by walking. They only allow 20 hikers on the day route, so it is advisable to get there early, particularly if you are going on weekends. The nature reserve is set on a peninsula that sometimes can leave one a bit disorientated, with the sea on one side and the Langebaan Lagoon, that links with the sea, on the other. It almost feels like being on an island and leaves you wondering how you got there. There is really has a bit of everything from crashing waves and beaches on the one side to still calm waters on the other, animals, rock formations and of course – flower. The walks are easy, with only one short climb on the day route (14km) that we were doing. There is also an overnight route that is booked up well in advance. For this you would need to carry your own tent. There is a small variety of game, with Zebra, Eland, Bontebok and Kudu being the most prominent. The flowers did not dissappoint, with carpets of white and blue stretching across the flat areas, punctuated by patches of orange. This is the macro view however and there are many more beautiful flowers would simply miss if you don’t get out on the walking paths. The bright orange and white of the daisies is the most dominant, but there are the pinks of the Oxalis, the reds and blues of the Gladioli, the very prominent blue irises and the yellow, orange and blue of the vygies. There are of course many others and it is very rewarding to spend a day of easy walking through this magnificent Park. At this time of the year one needs to keep a good look out for snakes – we came pretty close to stepping on a puff adder and were lucky enough to be able to get a photograph before it slithered fairly slowly away. There are also masses of tortoises and if you look at the photographs you will see a sequence of a fight between two males, with the one tipping the other over on to his back and then biting his legs every time he tried to right himself. Needless to say, he was rescued by the interfering humans. The day hike finishes with a short walk along the beach and back along the road to the car park. All in all a very satisfying days outing, but I did feel sorry for those who can only do it from a vehicle.